The SUV car segment in India is dominated by Hyundai Creta.In this post we will compare Renault’s launch in this segment called Captur. 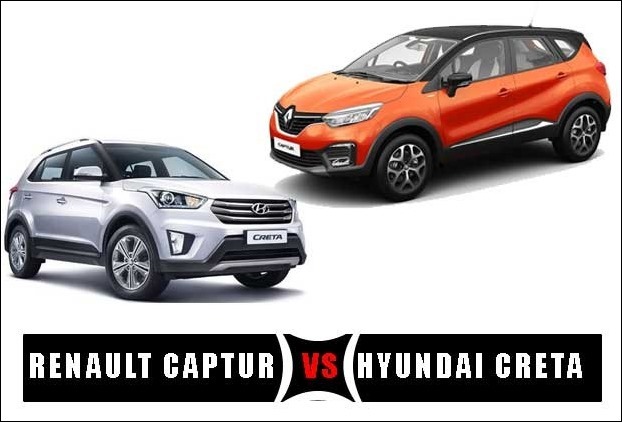 Renault Captur is based on Duster and Lodgy platform.The car directly competes with other suv cars in this segment but we will focus on Captur vs Creta review comparison. The wheelbase of Renault Captur is 83mm longer than Hyundai Creta.That means you will get more space in Captur.Its width is also 33mm more as compared to Creta.Hyundai Creta beats Captur on height front which is 11mm more than Renault Captur. Renault Captur also has an edge over Creta in ground clearance.So , while Hyundai Creta , has 190mm ground clearance , Renault Captur has 20mm more ground clearance with 210 mm overall ground clearance. The boot space of Renault Captur with 437L is more than that of Creta with 402L. Renault Captur has received LED Headlamps , tail lights and DRL but on the other hand Creta still has projector headlamps.Hyundai Creta still lacks LED lighting and DRL features.Captur has been introduced with 7 inch touch screen infotainment system.Hyundai Creta beats Captur here in the sense that Android Auto and Apple Carplay is still not available in Captur. Both cars have keyless entry and push button for start-stop and auto climate controls. In terms of safety features Hyundai Creta is way ahead from Renault Captur.Creta comes with 6 airbags , ABS , ESC , HSA like features.Renault Captur has only dual air bags. Hyundai Creta price is between Rs 9 lakhs – 14 lakhs while Captur price ranges from 9.99 lakh – 13.88 lakhs. Renault Capture in terms of engine receives the same 1.5L petrol and 1.5L diesel engine that its Duster uses.Its petrol engine outputs 105BHP and 142NM torque.Engine has received both 5-speed manual and CVT gear box options.Its diesel version outputs 108BHP power and 240NM torque.Diesel engine gets 6-speed manual gearbox. Hyundai Creta on the other hand 3 engine options – 1.6 L CRDI VGT diesel ,1.4L CRDI diesel and 1.6 L dual VTVT .These engine output 128, 90 and 123 BHP power.